Philips GoGear SA5245BT is a MP3 player that Philips claim to be able to guarantee superb quality sound with patented FullSound technology. GoGear SA5245BT features music, video, and photo playback, FM radio, voice recording, Rhapsody subscription music support, above-average earbuds, and wireless stereo Bluetooth audio. It can play up to 30 hours of non-stop music, and 6 hours of videos on its 1.8inch screen. The sound quality of the GoGear SA5245BT is better than most players from Philips. Its bundled earbuds that deliver better sound performance than Apple’s iPod. The GoGear SA5245BT delivers smooth, relatively crisp video, provided the source material is high quality. 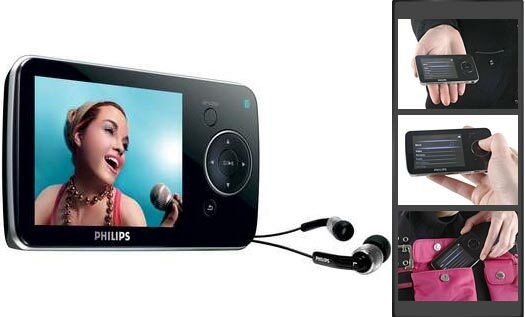 The Philips GoGear SA5245BT MP3 player includes music, video, and photo playback, FM radio, voice recording, Rhapsody subscription music support, above-average earbuds, and wireless stereo Bluetooth audio. The Philips GoGear SA5245BT isn’t flashy or slim, and it’s not the most affordable player in town. Videos require conversion before syncing, and audio enhancement features are few. 8.0GB, USB 2.0/Bluetooth 2.0, Hi-Speed USB, MP3/WMA, MPEG4/WMV, JPEG/BMP, LCD color display, 2.8″ (7.11cm), 320×240 pixel, 18 bit (262000 colors), FM tuner, voice recorder, internal battery, black color.